As I step into the darkened briefing room I’m immediately star-struck by the assembly of professional sailors waiting for their morning debrief to start. I scan the space for an empty seat. Almost all of them are occupied by recognizable Olympic, America’s Cup and Volvo Ocean Race icons, but I eventually squeeze myself into a chair between American yachtsman Doug DeVos and his strategist Dean Barker. 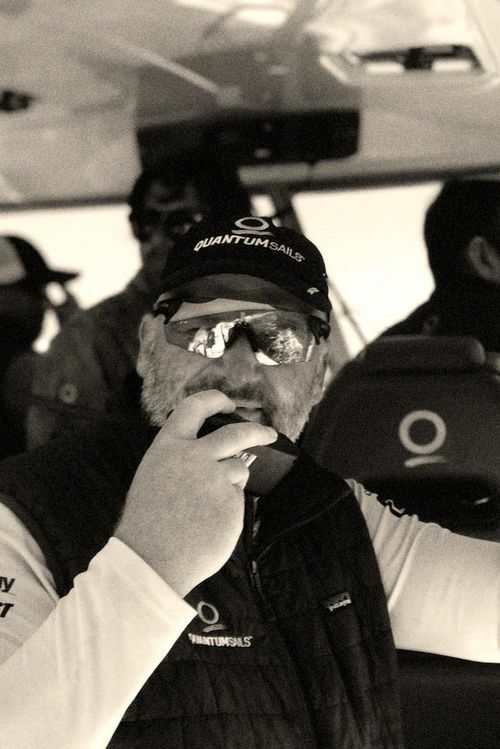 At the stroke of 0900, James Lyne, the performance coach for the TP52 team Quantum Racing, looks up from his computer at the front of the room, glances at his watch and then promptly starts the briefing. On the enormous plasma TV is a graphical leg-by-leg analysis of the previous day’s racing at the 52 Super Series event in Mallorca, Spain. 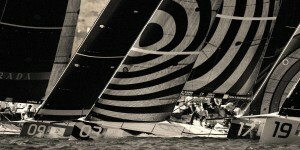 Each graphic shows the wind strength and angle around the course, with the tracks of numerous boats overlaid. As he continues to dissect the weather data, sailors around me nod their heads in agreement or listen dispassionately to what he has to say. He then transitions to a photographic comparison of upwind sail-trim setups for the three teams present, using images he shot himself from his coach boat. Trimmers in the room each sit at attention and crane their heads for an unobstructed view of the screen. “Cheese, what was your setup here?” Lyne asks Dirk de Ridder, of the Netherlands, who is trimming for Harm Müller-Spreer’s Platoon. De Ridder, attentive but leaning relaxed against the wall, pauses for a second before rattling off a set of numbers relating to the German boat’s setup. His answer triggers several minutes of discourse as sail trimmers from the other teams offer comments. Lyne listens attentively before moving the discussion to downwind setups, and then on to drone video of starts and the opening section of the beats. The audience continues to pay close attention to what’s on the screen and note Lyne’s observations. There’s more talk of weather before he finally concludes the session. Chair legs scrape the wooden floor as the sailors of Platoon and Onda, the Brazilian entry fielded by Eduardo de Souza Ramos, shoulder backpacks and scatter to individual briefing sessions elsewhere in the hotel. Remaining in the room for the exclusive Quantum Racing session are DeVos, Barker, tactician Terry Hutchinson, navigator Ian Moore, headsail trimmer Maciel Cicchetti, and mainsail trimmer Warwick Fleury. Moore leads off with an overview of several weather forecasts. He runs through the possible scenarios based on where in Palma Bay the race officer opts to run racing. Next, Hutchinson takes the floor, running through “room for improvement” topics he has identified from the previous day’s races. As he runs fluidly through a checklist ­scribbled in his tiny waterproof notebook, his delivery is upbeat and factual. There’s not the slightest hint of an accusatory tone. Lyne, Barker and DeVos interject from time to time with their own feelings or observations on what Hutchinson has to say. The dialogue is open, honest, direct and purposeful. Nobody talks for the sake of talking. Issues are aired, identified, analyzed and targeted as watch points for the coming races. As today’s competitive ­professional sailing landscape continues its inexorable slide toward foiling boats, only the hardy perennial 52 Super Series stands out as a beacon for conventional high-performance monohull racing. The series has been through a few changes since it first emerged in 2005 as the Audi Med Cup. When the Audi sponsorship ran its course at the end of the 2011 season, three owners from the class — DeVos; Sweden’s Niklas Zennström; and Alberto Roemmers, from Argentina — each stumped up their own funds to keep it alive. Seven years on, the series is stronger than it has ever been. The boats continue to be light and fast, having evolved as the result of a series of calculated changes to the TP52’s box rule. Crews of the mostly owner-driven boats are packed with the top stars in the professional yacht-racing firmament. 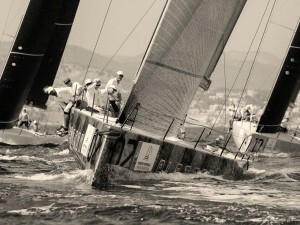 What continues to attract owners and crews to this series is the chance to race in ­glamorous locations around the Med. 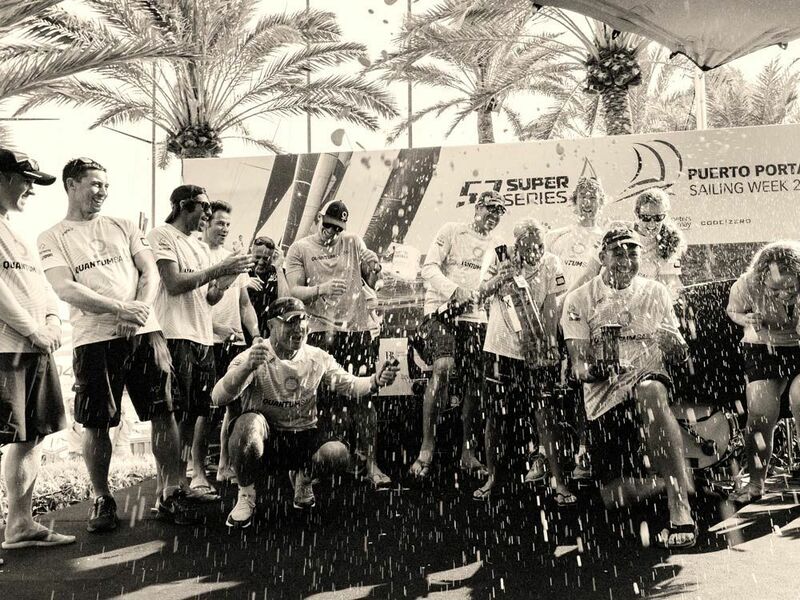 The 52 Super Series also remains one of the hardest inshore racing series to win, and there is a distinct pecking order among the teams. As is true of any competition, the most talent-laden teams eventually rise to the top of the rankings, but there are no guaranteed winners in this fleet. Every day of every regatta is a high-stakes, and expensive, scrum for a Champagne shower and podium place. This fierce competition is what led to the unique information-sharing agreement between the Quantum Racing, Platoon and Onda syndicates. 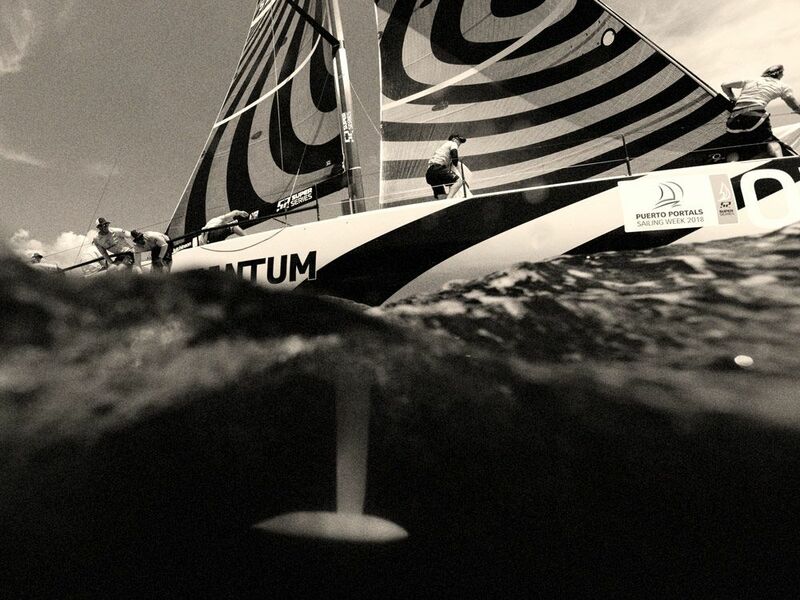 Under the agreement fostered by Quantum, the other two teams — both using Quantum Sails, of course — get access to Quantum’s tuning setup and attend the detailed morning briefing sessions with Lyne. According to Quantum Sails CEO Ed Reynolds, this collaboration with “rival” teams stems from the company’s original reason for competing in the TP52 class to begin with — product development. “This is our virtual wind tunnel,” Reynolds says. “It is the most consistent ­performance-measurement setup we could possibly have. It’s one thing to design sails that win sail tests, but racing sails are so different from testing sails. Assessing performance in a racing environment is so much more valuable than simply two-boat testing. If you just tested sails using two boats, you’d end up with extremely flat sails because you get a big running start. Aside from the company’s product development, Reynolds identifies another opportunity to strengthen his relationship with clients. As altruistic and visionary as this sort of thinking might seem, asking battle-­hardened professional sailors who race these boats to share hard-earned data and specialist knowledge — much of which translates directly into competitive advantage out on the racecourse — is a big step. The 52 Super Series is a fleet in which the owners pay handsomely for the expertise they need to get them to the front of the fleet. 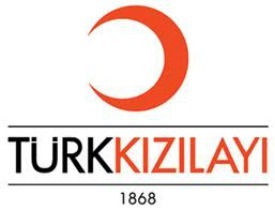 They hire and fire based on results and the sailors’ professional reputations. Financial remuneration is linked directly to their ability to deliver results. Lyne, of course, is at the heart of the collaboration project and critical to its success. 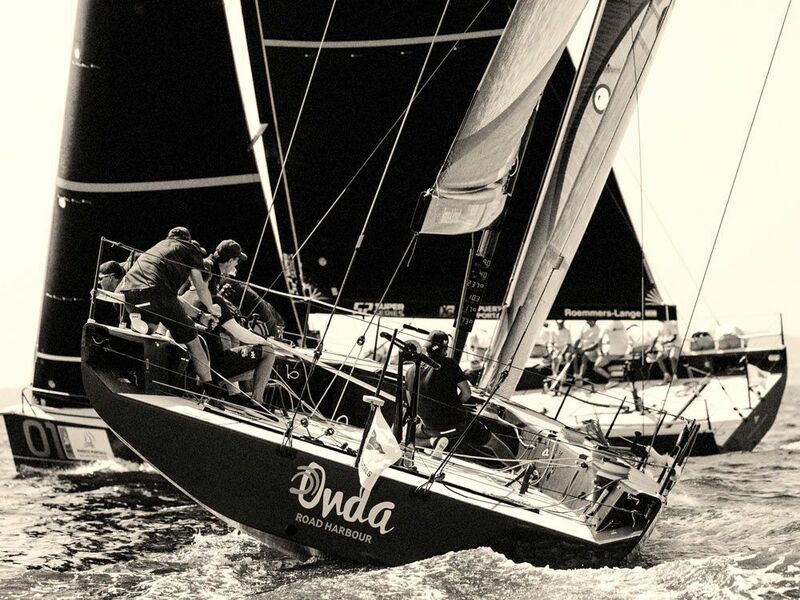 An Olympic campaigner from “many decades ago,” Lyne moved to the United States, where he switched to big-boat sailing for a few years before being recruited as a grinder for the British America’s Cup syndicate GBR Challenge. This was Lyne’s introduction to grand‑prix sailing, but he found himself, as he puts it in his own words, more useful off the water than on. “I started with that team as a grinder and ended up running the weather program, the spy program and coaching,” he says. 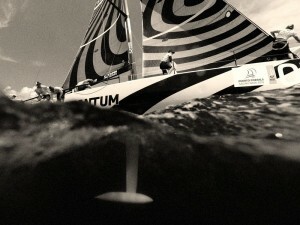 In 2013, Hutchinson recruited him to work on a few of the high-end campaigns he was involved with, the most prominent of those being Hap Fauth’s Maxi 72 Bella Mente and the Quantum Racing TP52. “I’m lucky to be a part of a group of people that form the core of several of these grand-prix-level campaigns,” says Lyne, who now has the same role with the New York YC’s American Magic America’s Cup challenge. Reynolds says Lyne’s role cannot be underestimated: “He has transformed the way we think about performance. This is an industry that was driven by the relevant opinion. Whoever had the best, most impressive resume would drive the thinking and the purchasing decisions by the client base. What James has done — and everybody inside Quantum rolls their eyes when I say this now — is like the story of the baseball movie Moneyball. He has gathered and analyzed the performance data to a point where he can take away the ­subjectivity that blurred everyone’s view of things. His role, Lyne says, is to make sense of it all and look for ways to improve the next day. Powerful indeed: More than 1 million data points each day are collected from the Quantum Sails TP52s and uploaded to the servers at specialist company KND SailingPerformance. As effective as this would be with data from one boat, Lyne says the team’s collaborative approach with Platoon and Onda gives a massive boost to the potency of the data. Combining the brainpower and talent of the likes of Robert Scheidt, John Kostecki, Ross Halcrow and Jordi Calafat, and picking everybody else’s brains too, it’s easy to understand how the problem-solving process is accelerated. After the morning briefing, down at the marina, DeVos extolls the benefits of the three-squad briefing sessions between his teammates and the sailors of Platoon and Onda. He’s not surprised by the knowledge sharing between these three disparate groups of professional sailors who are, after all, ultimately competitors. Eventually, by design or chance, the Quantum Racing chase boat and the team’s 52-foot raceboat leave their respective berths in the Puerto Portals Marina at precisely the same moment. They are the first team to leave the dock, and the synchronized exit does not go unnoticed by the rest of the sailors baking in the midday Mediterranean sunshine. At the top of the grand-prix sailing game there’s always more work to be done. But more hands make for quick work, and quickness around course is always the best path to the podium. Aboard the chase boat, I find a shady spot to settle in to observe Lyne in his coach role. Reynolds is also on board, along with media manager and drone pilot Keith Brash and three other members of the shore crew. 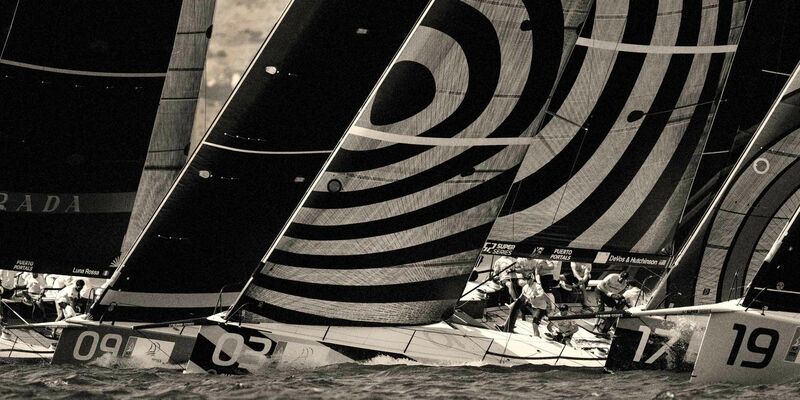 Once the thermal breeze makes a ­meaningful appearance, Quantum Racing, Platoon and Onda line up for an upwind tuning run. Lyne extracts his long-lensed camera and documents each of the three from astern, images for tomorrow’s morning meeting. His handheld radio crackles to life with Hutchinson asking for his opinion on the 52’s setup. Before answering, Lyne studies a small black tablet that displays live performance data transmitted from the boat. His answer relates specifically to what he’s observing with the Quantum boat. As the boats break off and turn ­downwind toward the start area, Hutchinson and Lyne continue their conversation about wind conditions and how the next hour or so might play out. The chase boat RIB darts in close to the boat several times to transfer headsails and spinnakers, and shortly before the race committee begins its start sequence, we go alongside to collect the snack bag and drop off full water bottles. We position ourselves beyond the leeward end of the start line, and the high-pitched whir of plastic rotors is unmistakable. Brash launches his drone into the sky to record the start. Lyne is animated (bordering on agitated) while the boat is racing, but he maintains his implacable even-tempered tone when talking to the sailors on the VHF between races. He has plenty to talk about, but he’s happy; Quantum Racing finishes the day with second and a fourth-place score line. Less than 7 points for the day. Hutchinson will be pleased. Back ashore, I quiz Lyne about the teams’ shared coaching program and how he views his role in the project. I suggest that the data and feedback he typically presents isn’t the answer in and of itself — but rather a way to help the sailors work out solutions for themselves. How much, I wonder aloud, is the team breaking new ground with this collaborative approach? Müller-Spreer’s Platoon crew won the World Championship in 2017, and was second on the series over the season. DeVos’ Quantum Racing won the entire 2018 season and the world title, while De Souza Ramos’ largely Brazilian Onda crew, which returned to the circuit for the 2018 season after a three-year absence, is considered one of the quickest boats around the course at times. He acknowledges they continue to make mistakes around the racecourse, but that’s all part of the process of getting to the top. 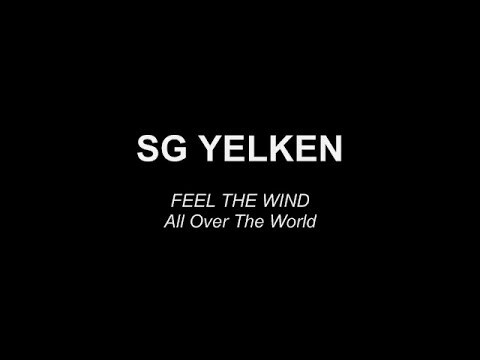 “Most teams here have done three or four seasons already, so it’s normal that we have a lot of things to work on.” Indeed, at the top of the grand-prix sailing game there’s always more work to be done. But more hands make for quick work, and quickness around course is always the best path to the podium.